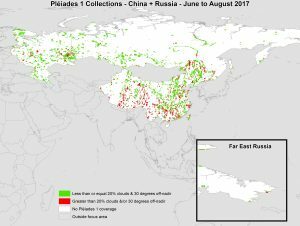 This map shows the areas imaged by the Pléiades 1 constellation from June 1 to August 31, 2017 over China and Russia. Please note that in many instances, multiple images were collected over the same area which is difficult to portray on this static map. This entry was posted in The Geospatial Times and tagged China, Pleiades 1, product updates, Russia, satellite, The Geospatial Times by Apollo Mapping. Bookmark the permalink.